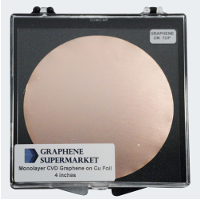 Home › Graphene › CVD Graphene › CVD Graphene on Metals › Single/Double Layer Graphene on Copper Foil: 4" dia. We offer graphene films that are predominantly single-layer graphene. These graphene films are grown on copper foil and continuous across copper surface steps and grain boundaries. Graphene is grown on both sides of the copper foil. If you require specifically graphene on one side only, please contact us directly. Etching of the underlying copper foil allows the carbon films to be transferred to other substrates such as glass, silicon dioxide or plastic films. To the best of our knowledge, there is no report of degradation of the CVD graphene over time when it is kept in a safe, dry place. The copper foil with single-layer graphene can exhibit some coloration due to slow oxidation of the copper foil, which does not affect the quality of the graphene film. SEM Image of Single Layer Graphene on Copper. Graphene is visible as the ridges. The most prominent features of the Raman spectrum of graphene are: a) the D-line, located at 1350 1/cm, b) G-line at 1580 1/cm and c) 2D-line (or G’-line) located at ~2675 1/cm. The number of microscopic defects in the graphene can be determined by the intensity of the D-line. The spectrum of perfect, defect-free graphene does not have a D-line. The D-line can also originate from the grain boundaries, chemical doping, and several other factors. We consider single-layer graphene to be of appropriate quality if the ratio of the intensities of the D and G lines does not exceed 0.1.